As some of you may have noticed, this seems to have become The Year Of The Animated GIF on my blog. I’m slightly obsessed! Yes, I know that I’m a few years late to the “graphical interchange format” party. But now that I’ve figured out how to animate these mysterious GIFs, I am totally hooked. They are so much fun! Plus, I’d argue that they are especially fun when it comes to food photos and trying to capture those great “action shots” of a delicious drizzle, or pour, or a step-by-step tutorial. Each time I post an animated GIF on my site, though, someone without fail emails and asks me how to make them. So I thought I would post a step-by-step guide today to share with you. I know that there are plenty of other tutorials online. But I have to admit that I spent hours reading dozens of them the first time I tried to make an animated GIF, and ended up getting mega-frustrated because all of them missed clarifying one very important step that (though it now seems obvious) was not clear to me. So for anyone else who might have also missed that step, hopefully this tutorial will make things crystal clear. 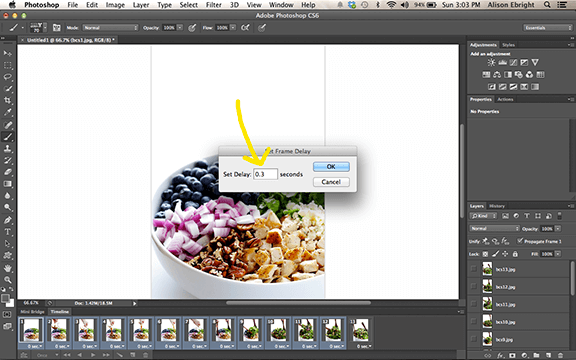 This tutorial is for Photoshop CS6, although I include a few tips if you’re using CS5. 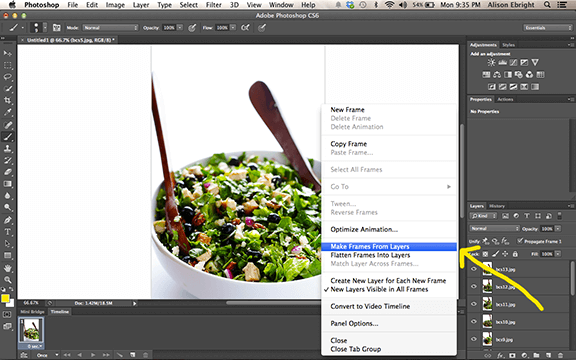 There are other tutorials online for Lightroom. And there are also quite a few websites now (i.e. GifMaker, MakeAGif, Imgflip, etc.) that will actually create an animated GIF for you within their site for free, although I have found that most have a limit on either the number of images you could use, the size of the file, or the timing of the animation, and quite a few altered the image quality. Boo. So if you’re looking to call the shots (literally), this tutorial is for you. 1. Before you begin creating your animated GIF, be sure that you have saved all of the photos that you will be using for the GIF. 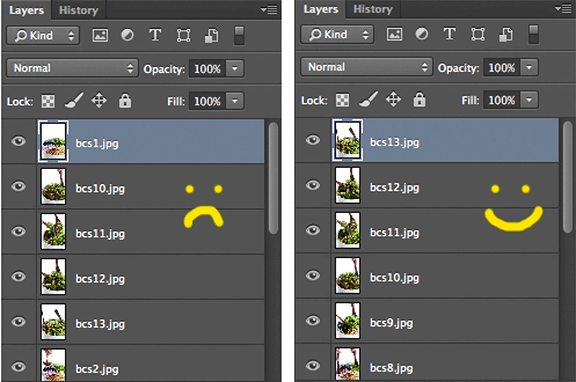 It is important to be sure that the images are all the same size/dimensions. I also like to number mine in the order that I want them played so that I can keep track of and identify them easily. As far as the actual photos themselves go, you can compile any kind of photo subjects together in an animated GIF. 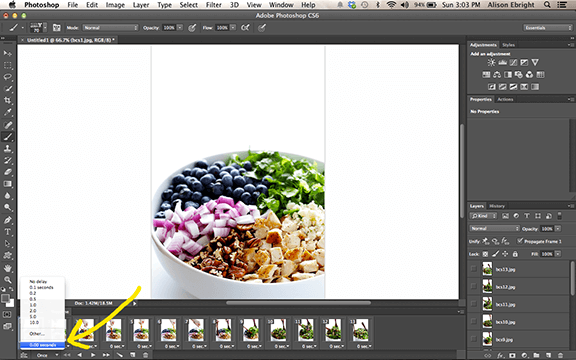 But for you fellow food bloggers, if you are looking to do an action shot with the same subject (like the salad I’m using in the example), I strongly recommend using a tripod so that the subject (the bowl) will stay in focus and not move. 2. 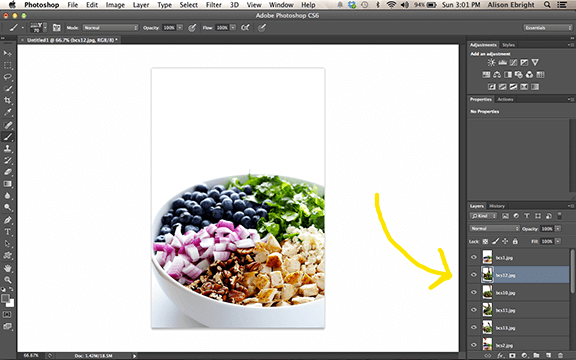 To begin, open Photoshop. 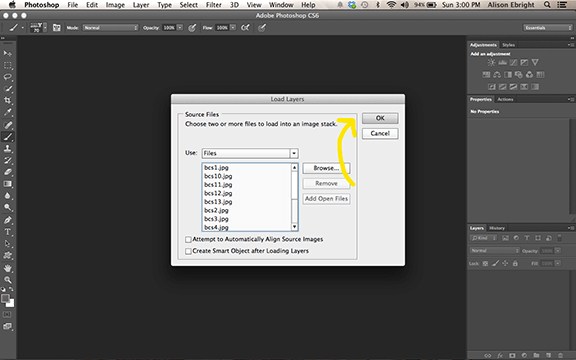 Click File -> Scripts -> Load Files Into Stack. 4. 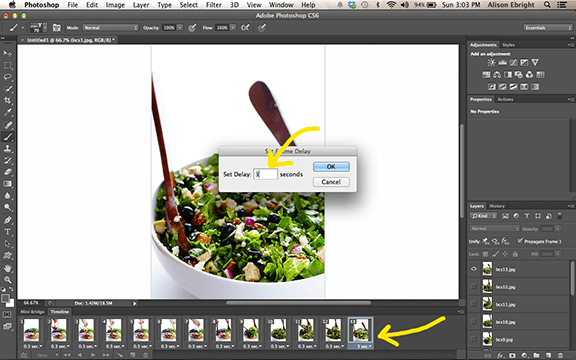 Locate the image files that you want to use, select all of them, then click Open. 5. As you can see, all of the files will show up in the little box underneath “Files”. They may be out of order, but that’s alright. Click OK.
6. 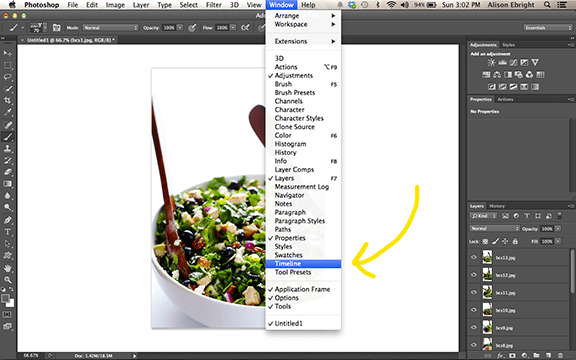 All of your files should show up in the “Layers” window in the sidebar. Now is the best time to put them in order…descending order, that is. Your first file (the one that will begin your animated GIF) should be at the very bottom, and your last file should be on top. 7. Before vs. after. As you can see on the right, my files are now in descending order (13, 12, 11, etc.). Although if you end up wanting to move files around afterwards, don’t worry because they can still be adjusted. I just find it easiest to organize all of them here. 8. Click Window -> Timeline. This will open up a new timeline window at the bottom of your screen. 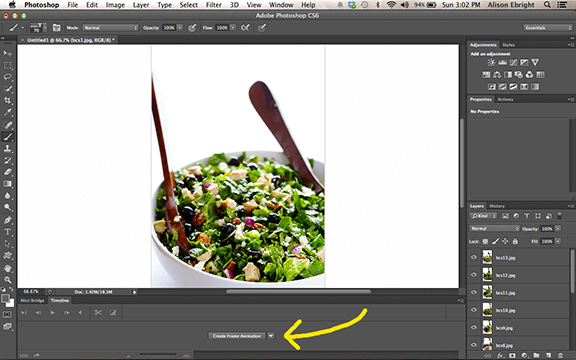 If using Photoshop CS5, click Window -> Animation. 9. And now for the important part, click on the words “Custom Frame Animation”. This was the part I couldn’t understand for the life of me in other tutorials. I kept clicking on the little arrow, and all that did was offer a dropdown option for “Create Video Timeline” (not what you want). 10. A single image will appear in the Timeline window. Then, click on that tiny little icon that looks like a list in the top righthand corner of the Timeline window. 11. 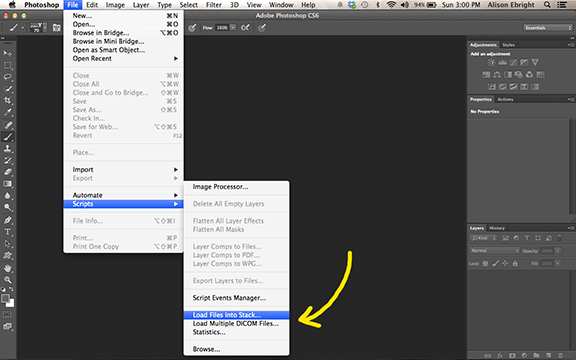 Click “Make Frames From Layers” from the option menu. 12. Now all of your images should appear (in order) within your Timeline window. As you can see, each image is listed with the amount of time it will be shown when the animation is playing. The default is 0 seconds, but for my purposes with food photography, I like to make that just a tiny bit longer. 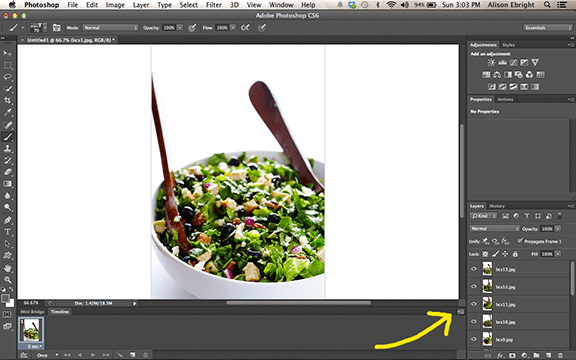 So to change the amount of time on an individual image, click the little dropdown arrow next to where it says “0 seconds”. 13. A bunch of options will then appear for how many seconds you would like for that frame to be shown (0.1 seconds, 0.2 seconds, etc.). Click the option you’d prefer. 15. …and it will let you select the amount of time for all of them simultaneously. 16. Because I’m uber picky, I have actually decided that I like to set mine at a different speed than the initial list offers — 0.3 seconds. 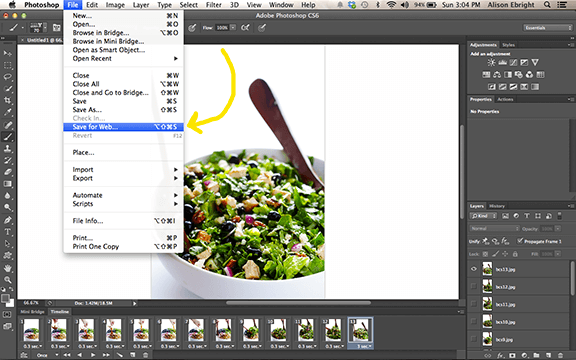 So to do that, just select the “other” option from the menu and type in your desired amount of seconds (such as 0.3). 17. I also always set my final image for 3 or 5 seconds, so that the animation can pause before the animated GIF starts replaying. 18. To test how your animation speeds look, just hit the “play” arrow at the bottom right of your screen for a preview. If need be, you can also drag and move around the order of the images if you see anything that you’d like to change. 19. Once it looks good, you’re ready to save! 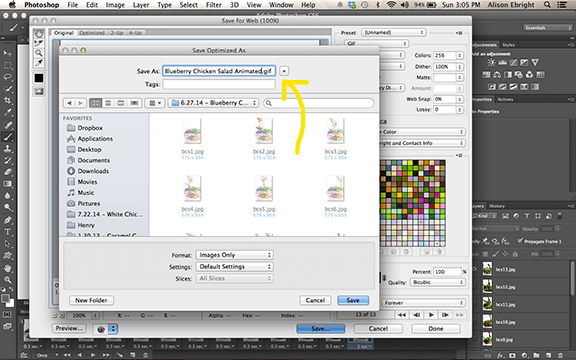 In order to save an animated GIF, you need to do so in the “Save For Web” option (vs. “Save” or “Save As”). 20. There are two changes I make in this screen from the defaults that show up. 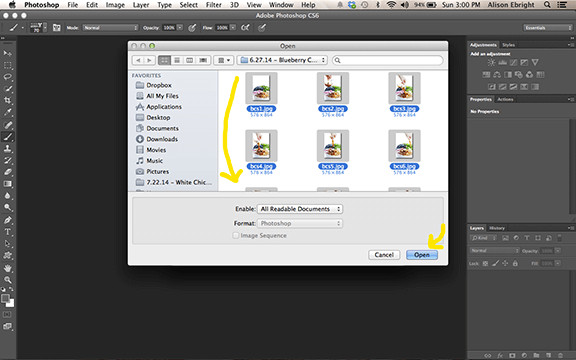 First, I prefer to save full-size files of my animated GIFS. 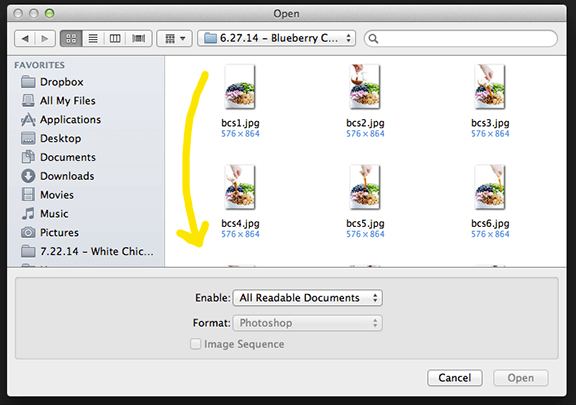 So to do so, I click the “Original” tab in the upper righthand corner (instead of “Optimized”, which is the default). 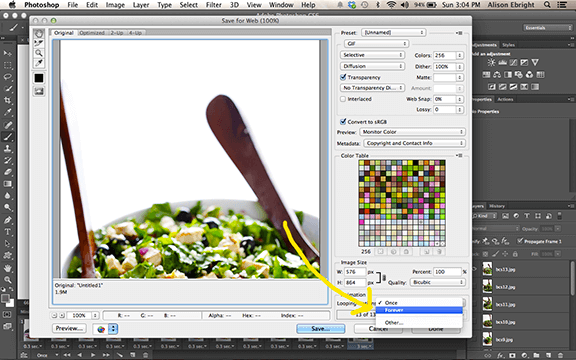 This option maintains the all of the original colors in the image, which is important to me. But if you are interested in reducing the file size, here are your other options. 21. How To Reduce The File Size Of An Animated Gif: The default for saving animated GIFs is the “Optimized” option. Once you click “Save For Web”, the “Optimized” tab should be open in the upper lefthand corner. 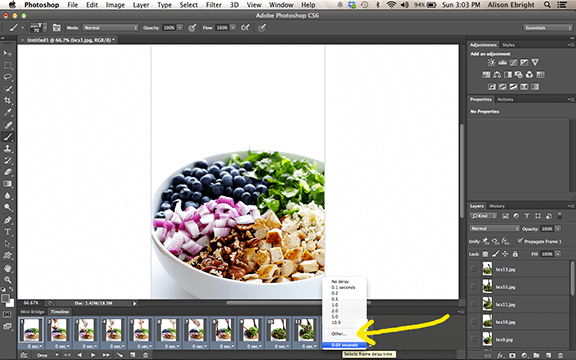 Contrary to what the name implies, this option will actually increase your file size. And I find that it reduces the clarity a bit. So I’m not a fan. But…once you’re in the “optimized” mode, you can adjust the number of colors that are used in the animated GIF if you would like to reduce the file size. It’s kind of hard to see in these small photos, but here are some examples back-to-back. The first uses all 256 colors (the maximum number). All of the colors look true to the original, although not 100% as clear. 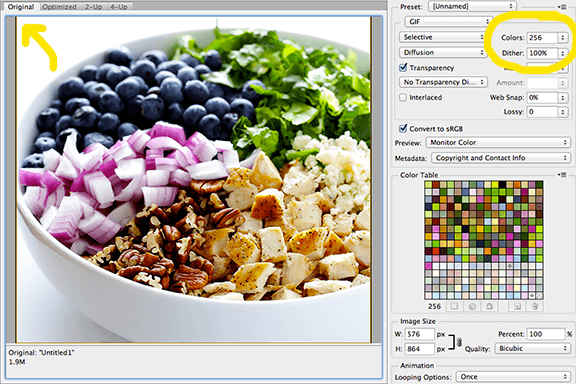 The second uses 128 colors. The colors still look pretty vibrant, but a few places look “off” (the dark piece of chicken in the front turned slightly purple) and the image starts to become a little grainy. The third uses 64 colors. The colors are very clearly washed out, and the image is getting super grainy. And here is a closeup of the “original” that I chose to use. (Again, you have to click the “Original” tab in the upper righthand corner.) It uses 256 colors. The colors look vibrant, the image is the most clear, and it’s a winner in my book. 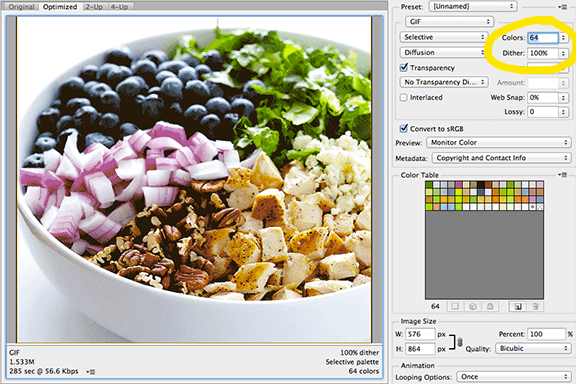 Animated GIFs will always look slightly grainy since they are working with a maximum color palate of 256 colors, and JPGs use thousands. (Animated GIFs weren’t really designed for high quality photo animations.) But I find that the original tab is the best option offered. 22. I also like to change the “Looping Options” in the bottom righthand corner to read “Forever” instead of just once. This is basically the option that says how many times you’d like your animated GIF to repeat itself. Your options are “Once”, “Forever”, or you can choose “Other” and then specify that you’d like it to play 5 times, or 10 times, or whatever number sounds good. I know that the “Forever” option may seem annoying, but since readers may take awhile to scroll down to the part of my blog post where the animated GIF resides, I choose “Forever” so that it’s sure to loop through at least once when they see it. Also, be sure to double check that the dropdown menu underneath Preset in the upper righthand corner says GIF (not JPG, PNG, etc.). Very important for zee ol’ animated (yes) GIF. 22. Then click “Save”, and title your image, and click “Save” once more, and you’re done!! Just upload it to WordPress or whatever software you use like a regular GIF or JPG, and you’re good to go. You know how they have pinterest fails? I feel like me trying to do an animated GIF would be “cool food blogger fail” lol. Maybe one day I’ll work up the nerves to try it. ;) And on that note, you have the most beautiful photos (animated or not) I’ve ever seen. i always wondered how this is done..thank you for the tutorial. What a great tutorial! Animated gifs are always fun! Awesome tutorial Ali! I’m going to use this for my blog AND for work so thank you, thank you! Wow super useful tutorial! The photos with steps are really helpful. I played around with animated gifs recently for an upcoming stuffed burger recipe, where I wanted to show steps on how to make and fill it. I like your idea about adding a longer pause at the end. Thanks! I generally don’t come to GMSO for tutorials like this, so initially I was annoyed however I could see where some readers may find it interesting. Once I started reading I found the post to be a bit lengthy and over detailed to achieve a simple task. Love this!! I’ve always wondered how to make animated gifs! Thanks for sharing this great tutorial. I have always wondered how these are made! First I have to actually use my tripod in order to take different photos in order to put together a gif haha. But great tutorial, I saved for later! Such a great tutorial, thanks Ali! I’m so glad Kevin from Closet Cooking sent me this link. I’ve been wanting to learn how to make GIFs. Thank you this post! I read this tutorial ages ago when you first posted it, but I’d kind of forgotten about it. Then I had the idea to make an animated GIF for my post on Monday, and somehow I remembered this in the back of my mind! THANK YOU so much for the tutorial. It was super easy to follow, and I was able to put my GIF together in less than 5 minutes (once my images were edited). You rock! This was sooooo helpful! I’ve looked at several tutorials but none as clear and straightforward as yours. And pretty too. Plus I love how you compare the different quality options—with my photography background I can’t help but cringe at the results from online gif-makers. Thank you thank you for sharing this, just made my first gif for my blog and I love it! Thank you for this! So SO helpful! You’re very welcome, we’re glad we could help! A gif tutorial that makes sense, thank you! Thanks SO much for sharing this tutorial! I have used GifMaker in the past but was frustrated with image quality. 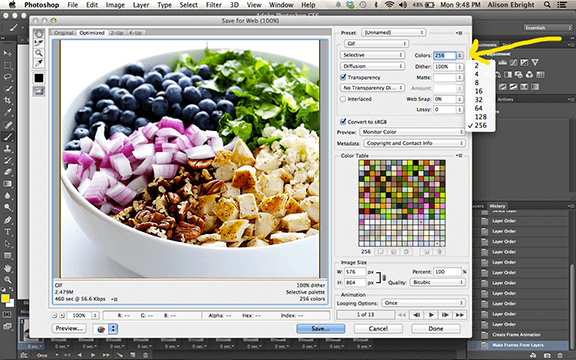 I can’t wait to try your tutorial out in Photoshop! I recently found your blog and I love this tutorial! Sometimes videos are too long unless there are 3x the speed to show a recipe. Making a GIF is the perfect solution. I’m going to try it out with my next recipe! Thank you! Thanks for the detail giff making method i was using an animated video maker to make giffs but photoshop is best for making giff when its comes to detail editing. You’re most welcome, Jeff — we’re so glad you found this helpful!